If you’re a spa owner, it’s not too late to surprise that special someone with a beautiful night to remember. By making a few simple changes, you can transform that same ordinary scenery into a romantic getaway. Lets get into some of the little details that will really set the mood for your spouse this Valentines. Lighting and music can make a romantic atmosphere -lighting is everything. Color temperature is a huge factor in setting the mood. Be sure to dim the lights and light a few candles around the patio. Make sure the lighting is soft and dim. If lighting creates the atmosphere, music sets the mood. Many of our American Spas are equipped with a sound system & LED under water light & some even come with LED waterfalls to complete the perfect romantic setting. Pour a little romance with the perfect wine and yummy finger foods. Don’t over-plan. Pick up some ready-made meat and cheese deli trays or some sweet treats, like dipped strawberries or mini cheesecakes. Keep things small but diverse don’t overwhelm yourselves with food. It’s a hot tub not a buffet. When decorating with flowers around your spa, you’ll enhance the scenery with some color and greenery. 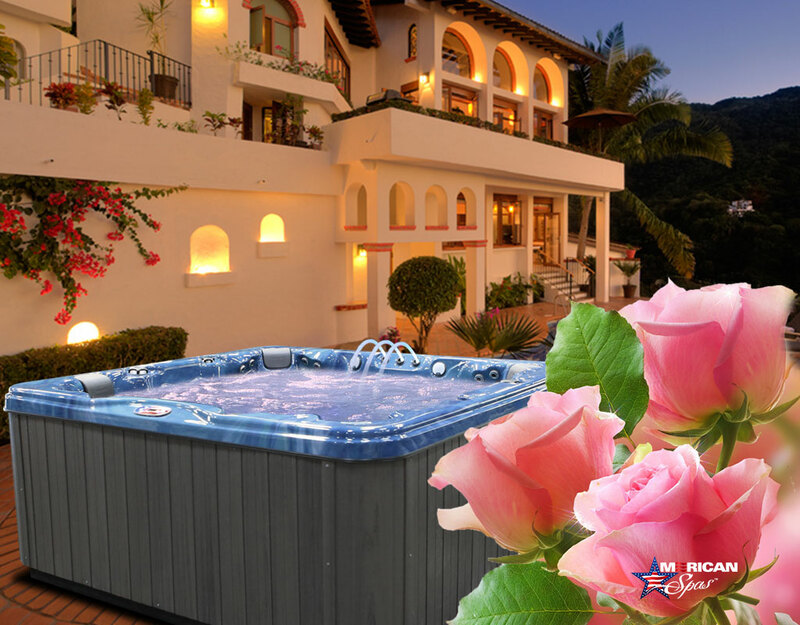 For a more romantic setting, make a path with rose petals to the spa. Purchase a couple of blooming potted flowers so the gift of valentines lives on. Add an alluring scent to the atmosphere and inspire all the senses. Let hydrotherapy and aromatherapy take you both away and relax. For aromatherapy check out these hot tub friendly bath salts and bath bombs that will set anyones mood. Create and decorate the dressing area with towels and robes, layout the swimsuits or perhaps surprise them with something new. Plus, include a little gift or treat; it’s the little touches that make a difference. With a glass of wine in hand, soothing music softly playing, and soft lighting, you’re off to an ultimate romantic date night & a terrific time to relax and spend some quality time with the one you love. Happy Valentines day from all of us at American Spas!